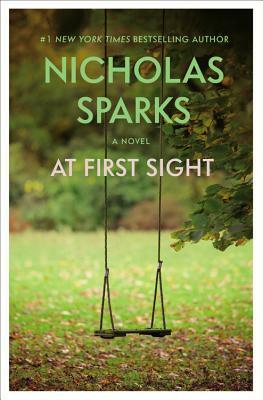 About 4 night ago I finished At First Sight by Nicholas Spark. I am not a huge fan of this type of writing but my dear Friend is. Romance books are not my thing but I have seen The Notebook (one of my favorite movies) and A Walk to Remember, both by adapted from Spark books and I loved them. At First Sight, wasn't torture for me to get through but I didn't crave to get back to it. I love that feeling of wanting to read all the time. Getting engrossed in the characters and the story and as you get toward the end, you don't want to read the last few pages because you don't want it to end. This was not that kind of book for me. The book is about Jeremy a writer and Lexie, a librarian he meets when he visits a small town to get a story for his column. Maybe if I had read True Believer the precursor to this book I would have liked it better?! It was supposed to be this great love story of this couple who come from very different backgrounds and after she gets pregnant try to make a go of it. I didn't find the relationship strong or loving. I didn't particularly like Lexie and was often left wondering why Jeremy stayed. There is a level of mystery but I have never been a great fan of that either so for me it was unnecessary. As Lexie's pregnancy become problematic the story became more interesting for me. I felt like the story just dragged then this was this problem, and the story just took off for me. It was like when you are sitting in traffic, moving at 2 miles an hour for a long period of time and then the traffic clears, you see no indication as to why it was slow to begin with, and you are suddenly doing 65 miles an hour with no cars in front of you. The ending was abrupt and sad but not sad enough to bring tears to the eyes of this usual cry baby. I am sure for Nicholas Sparks fans this book was everything they had hoped for. For me, not so much. Not to say it is badly written, just not my cup of tea as they say. This book is a continuation of the story begun in True Believer. It captures many of the adjustments involved in early marriage and pregnancy and the realization that men and women think and act differently. The couple struggles with learning to trust each other when someone is deliberately trying to break them up. There is tragedy and healing. Another heart-wrenching story from Nicholas Sparks that moves one to contemplate the things that mean the most in life. Two people who fall in love, move forward from their pasts, and love each other wholly; created a bond and a life. Prepare yourself for another sad ending from Sparks.